Heat oven to 325°F. 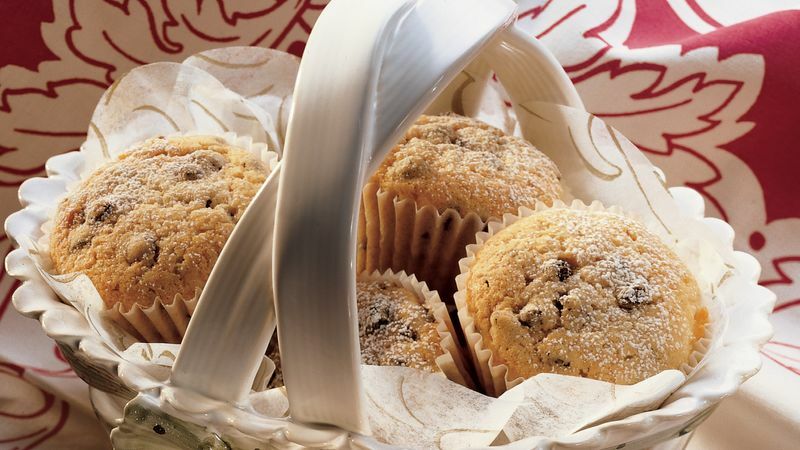 Place paper baking cup in each of 18 regular-size muffin cups. In large bowl, beat granulated sugar and butter until light and fluffy. Beat in 1 egg at a time until well blended. Add lemon and orange extracts; beat well. Gradually add flour, baking powder and cinnamon; mix well. Stir in currants. Pour batter into muffin cups, filling each 3/4 full. Bake 25 to 30 minutes or until toothpick inserted in center comes out clean. Immediately remove from pan; cool 5 minutes. Sprinkle with powdered sugar. In Colonial America, it was common for cake to be named after the rank of royalty. The cost of the ingredients for a cake was related to the importance of rank. For example, King's Cake called for expensive fruits, nuts and spices. The next most expensive cake was Queen's Cake, made with fruits, spices and brandy. This version of Queen's cake is a very rich butter muffin filled with currants, cinnamon and citrus flavorings.